It’s almost Valentine’s Day. A perfect excuse to make something sweet and pink, not that I really need one. 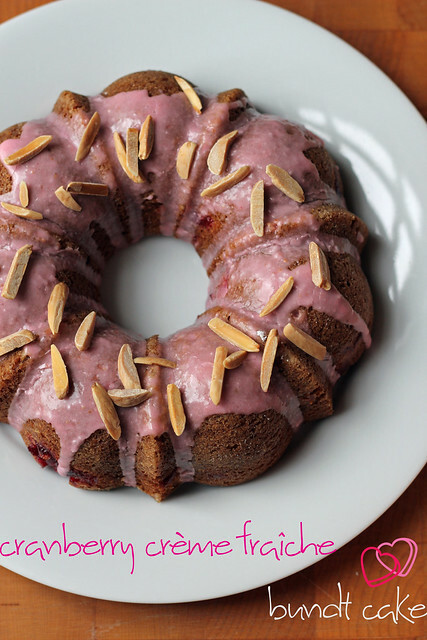 I never need an excuse to make a Bundt either– I just love them! 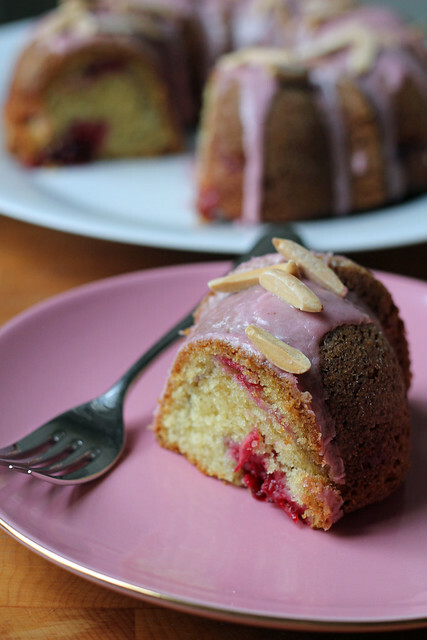 This Cranberry Crème Fraîche Bundt Cake seemed like just the right treat to make this year. I know that cranberry season is gone, but if you’re like me, you bought a couple of extra bags during the holidays and threw them in the freezer. When there’s not a lot of good fruit around, this comes in handy. This cake uses a lush ingredient–crème fraîche. You can make your own, but I just buy it. It’s pretty easy to find now, even at TJ’s. The crème fraîche gives the cake great structure and texture. It also helps make it a great keeper. The pockets and swirls of tasty cranberry sauce inside the cake ensure that each slice just as pretty as the uncut Bundt. I liked the little bit of almond flavoring in the cake as well, but I’m sure it would be great without if you don’t have the extract or you avoid nuts. Don’t want cake, try coeur à la crème. Steph’s Note: I buy my crème fraîche at the grocery store, but you can certainly make your own. To do this, you’ll want to start at least a day before making this cake, and you’ll need 2 cups (480 ml) heavy cream and 2 tablespoons buttermilk. Combine the heavy cream with the buttermilk, cover tightly, and let sit at room temperature (in a warm room) for at least 8 hours. Stir the mixture– if it hasn’t thickened completely, cover the mixture again and let it sit in a warm place for another 2 to 3 hours and check it again. When it has a nice, thick consistency, it will keep in an airtight container in the refrigerator for up to 2 weeks. -Preheat the oven to 350°F (180°C/gas 4). Brush the inside of a 10-cup (2.4 L) Bundt pan with the melted butter and dust it lightly with flour and tap out the excess. -Whisk the flour with the baking soda, baking powder, and salt in a medium bowl until thoroughly combined. -In the bowl of a stand mixer fitted with a paddle attachment, beat the butter with the sugar on medium speed for 2 to 3 minutes, until light and fluffy. Add the eggs, one at a time, beating well after each addition. Beat in the vanilla and almond extracts. -With the mixer on low, add the flour mixture (in three increments) alternately with the crème fraîche (in two increments), beginning and ending with the flour and beating after each addition until just combined. -Pour half the batter into the prepared pan. Swirl half the cranberry sauce over the batter. Pour the remaining batter over the cranberry sauce, and then swirl the remaining cranberry sauce over the batter. I tried my best to more or less keep the sauce from touching the sides of the pan and tube, just so there wouldn’t be any sticking. Bake for 50 to 55 minutes, until golden brown on top and a skewer comes out free of wet batter. -Swiftly rap the pan on the counter once or twice right after pulling it from the oven…this will help the cake settle and release. Let the cake cool in the pan on a wire rack for about 15 minutes, then invert the cake onto the rack and let it cool completely. Transfer the cake to a serving plate and drizzle the glaze over the cooled cake. Sprinkle the almonds over the top. The cake will keep in an airtight container at room temperature for up to 2 days. -In a medium saucepan over medium-high heat, combine the cranberries with the water, sugar, and salt and cook for about 15 minutes (after about 10 minutes, remove about 2 tablespoons of the liquid for the cranberry glaze), or until the sauce has thickened and most of the liquid has reduced. Let the sauce cool completely before using it in the cake (you will need about 2 cups of sauce for the cake, so you may have a bit extra). The sauce keeps in an airtight container in the refrigerator for up to 3 days. -Mix the confectioners’ sugar and 1-2 tablespoons cranberry juice (depending on your desired thickness) in a small bowl until smooth. Be very nice with raspberries too! How pretty! I love the colors of this. So so pretty. I love the pink frosting and the pink berries peaking out from inside the cake. I bet the creme fraiche makes this sooo creamy and delicious! This cake is beautiful! And I have a feeling it tastes amazing, too. Love the idea of cranberry creme fraiche! This looks incredible – almost too pretty to eat!